There are over two hundred different species of owls. Owls are found on almost every continent. Owls can turn their heads almost completely around and are farsighted, which means that they can only see things that are far away. Owls range greatly in size and appearance. While most of the world’s owls are a brownish color they exhibit a multitude of color patterns. Most owls are not known by the general public (Fun). One of the least known about and least researched owl is the Cuban Screech owl or Margarobyas lawrencii. The Cuban Screech Owl or Bare- Legged Owl is a small owl that is endemic to Cuba. “Endemic” means that the owl is only found naturally in Cuba (Planet). The Cuban Screech Owl is referred to by three different scientific names. The most common scientific name is Gymnoglaux lawrencii (Wiley). A more general name used for the owl is Otus lawrencii (Banks). Most recently, the scientific name was changed from the genus Gymnoglaux to Margarobyas (Chesser). Originally, scientists had thought that the owl was similar to the species in the genus Gymnoglaux (Olson). All of the species in Gymnoglaux are very closely related to one another which made it hard for scientists to correctly identify which species belongs there (Lawrence). 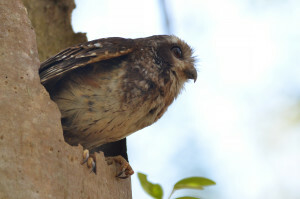 Scientists studied the owl more and discovered that it was not as closely related to the genus Gymnoglaux as scientists had previously thought. They found that it was more closely related to the species in Margarobyas (Lees). The Cuban Screech Owl is in the avianfamily Strigidae. The owl is a little different than most of the owls in the Strigidae family, however, since most of the owls in that family have feathers on their legs and the Cuban Screech Owl does not (Lewis). The Cuban Screech Owl is a fairly small bird which is only about 20-23 cm long and 80 g in weight. They are mostly brown with a whitish face and fair white spots down their backs. They have a grayish coloring on their bellies and on their bottom wing feathers (Cuban). The most prominent feature, and the characteristic that gives it its name, Bare-Legged Owl, are its long, featherless legs. Its legs are a yellowish-brown color (Lewis). Almost all of the world’s species of owls have feathers the whole way down their lower appendages, so this absence of leg feathers makes the Cuban Screech Owl a rarity (Cuban). The owl is plump with a big head and big, round eyes (Raffaele). It also has no ear tufts. Scientists have not completely figured out the function of the ear tufts, but they know that the tufts do not have any effect on the owl’s hearing (Perrone). Since owls are most active at night, an owl’s hearing is one of their most prominent senses. Most owls can hear even the slightest movement of their prey from long distances (Lewis)The most similar owl to the Cuban Screech Owl is the Burrowing Owl (Garrido). Not much is known about the population size of these owls (Cuban). The population appears to be stable because it is a common bird around Cuba (Species). The owls are adaptable to humans. They are not overly impacted by the development of new towns and cities in their habitat (Neotropical). The range of the species is very large, so ornithologists do not feel that the owls are in any danger of being threatened with decline or extinction (Planet). There are also no mammalian predators that prey on these owls (Perrone). Humans and natural causes (accidents and disease) are the most probable causes of mortality for this species. They are the only small owl present in their range (Beauty). The species does not migrate, and they are year-round residents of Cuba (Ibarra). 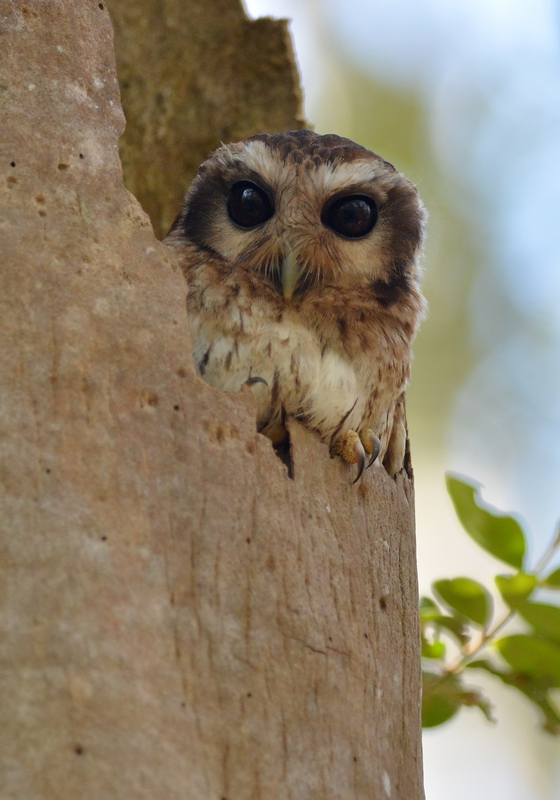 There is also a small population of these owls on Isla de Pinos (Planet). M. lawrencii are a nocturnal species (Raffaele). During the day, the owls can be found in densely wooded areas (Beauty). They prefer areas with palm trees into which they can bore holes and establish nests . Sometimes, they use used abandoned woodpecker holes for their nest sites (Cuban). They can also be found in thickets or in caves. They are usually found on the ground while looking for food (Lewis). Their diet consists of mainly large insects, but they also eat frogs, snakes, and sometimes other small birds (Lynx). A typical call for a Cuban screech owl is “coo-coo-coo-guguguk” (Lewis). The call has a bouncing rhythm to it (Marshall). The call becomes higher pitched towards the end (Lynx). The mating season for the owls is thought to be from March to May. The females usually lay two small, white eggs (Bond). Most of the time, the females nest in tree cavities (Lynx), and they come back to a nest site for multiple years in a row (Beauty). “Bare-legged Owl (Gymnoglaux Lawrencii).” Planet of Birds, 2015. Web. 30 Sept. 2015. “Bare-legged Owl (Margarobyas Lawrencii) -.” Neotropical Birds. Ed. T.S. Schulenberg. Cornell Lab of Ornithology, 2010. Web. 29 Sept. 2015. “Bare-legged Owls or Cuban Screech-owls.” Beauty Of Birds. 2011. Web. 30 Sept. 2015. “Cuban Screech Owls – National Geographic.” National Geographic Society, 2015. Web. 29 Sept. 2015. “Bare-legged Screech-owl (Margarobyas Lawrencii)”. Lynx Editions, 2014. Web. 29 Sept. 2015. Bond, James. Birds of the West Indies. 2nd ed. Boston: Houghton-Mifflin, 1971. 120. Print. “Fun Owl Facts for Kids – Interesting Information about Owls.” Science Kids. Web. 30 Sept. 2015. Garrido, Orlando H., and Arturo Kirkconnell. Field Guide to the Birds of Cuba. Ithaca, N.Y.: Comstock Pub., 2000. 134-135. Print. Lewis, Deane. 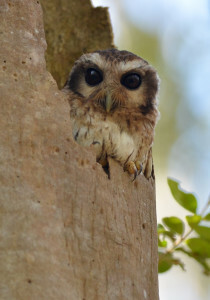 “Owls: Species: Gymnoglaux – The Owl Pages.” The Owl Pages. The Owl Pages, 2015. Web. 30 Sept. 2015. Raffaele, Herbert A. “Otus Lawrencii.” Birds of the West Indies. Princeton: Princeton UP, 2003. 100. Print. “Species Facts Sheet- Bare-legged Screech-owl (Margarobyas lawrencii)”. BirdLife International, 2015. Web. 29 Sept. 2015. Banks, Richard C., et al. “Forty-Fourth Supplement To The American Ornithologists’ union Check-List Of North American Birds.” The Auk 120.3 (2003): 923-931. Google Scholar. Web. 29 September 2015. Chesser, R. Terry, et al. “Fifty-fourth supplement to the American Ornithologists’ Union check-list of North American birds.” The Auk 130.3 (2013): 558-572. Google Scholar. Web. 29 September 2015. Hekstra, Gerrit P. “Description of twenty four new subspecies of American Otus (Aves, Strigidae).” Bulletin Zoologisch Museum 9.7 (1982): 49-63.Google Scholar. Web. 30 September 2015. Ibarra, Elena. “Bird Surveys In The Mogote Vegetational Complex In The Sierra Del Infierno, Pinar Del Río, Cuba, June 2000.” EL PITIRRE: 7. Google Scholar. Web. 30 September 2015. Lawrence, George N. “On the members of the genus Gymnoglaux.” Ibis 20.2 (1878): 184-187. Google Scholar. Web. 30 September 2015. Lees, Alexander C. “Splits, lumps and shuffles.” Neotrop. Birding 7 (2010): 31-38. Google Scholar. Web. 30 September 2015. Marshall, Joe T., Robert A. Behrstock, and Claus König. “Special Review.” The Wilson Bulletin (1991): 311-314. Google Scholar. Web. 30 September 2015. Olson, Storrs L., and William Suarez. 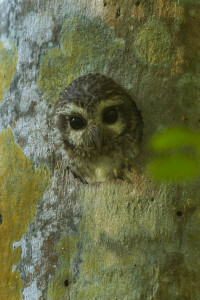 “A new generic name for the Cuban Bare-legged Owl Gymnoglaux lawrencii Sclater and Salvin.” Zootaxa 1960 (2008): 67-68. Google Scholar. Web. 30 September 2015. Perrone Jr, Michael. “Adaptive significance of ear tufts in owls.” Condor 83 (1981): 383-384. Google Scholar. Web. 29 September 2015. Wiley, James W. “Status and conservation of raptors in the West Indies.” Birds of Prey Bull 3 (1986): 57-70. Google Scholar. Web. 29 September 2015.